On September 1, 1890, the Austrian Empire definitive stamps of 1867 to 1883 were replaced with a brand new, more modern looking, series of definitive postage stamps. These new Austrian definitive stamps featured an oval, with the portrait of Emperor Franz Josef I. At the sides of the lower denominations were the words describing the Austro-Hungarian Monarchy, and at the top and bottom was the word "Kreuzer". These new issues also featured the first appearance of Gulden denominated definitive postage stamps. All of the stamps issued during this period, including mint condition examples, are relatively common and inexpensive. These issues can provide an attractive and affordable basis for a philatelic study of shades, plate varieties, perforation varieties, and Austrian Empire postmarks. 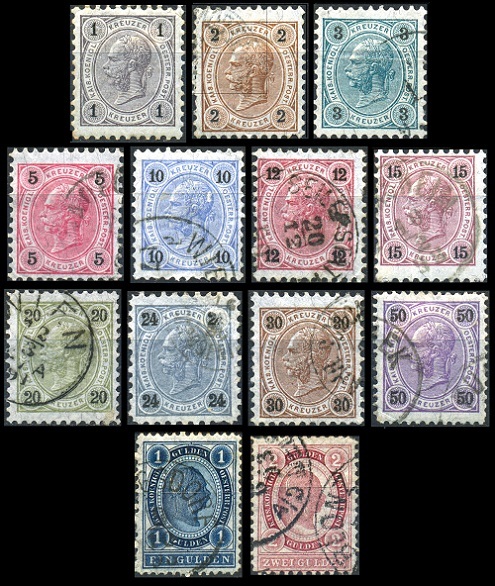 The thirteen major-type Austrian Empire portrait definitive stamps shown above were issued on September 1, 1890. They are printed on unwatermarked granite paper, and they were produced in many perforation gauges. The numerals on the Kreuzer denominations are printed in black on a colored background. The numerals on the Gulden denominations are white on a colored background. The Michel / Scott catalog attributes, for stamps that are perforated 10, are as follows. The colors used in the table are from the Michel catalog. 01 K. (1890 - Mi. #50A, Sc. #51) - Dark Gray. 02 K. (1890 - Mi. #51A, Sc. #52) - Dark Brownish Ocher. 03 K. (1890 - Mi. #52A, Sc. #53) - Dark Greenish Blue. 05 K. (1890 - Mi. #53A, Sc. #54) - Carmine. 10 K. (1890 - Mi. #54A, Sc. #55) - Grayish Ultramarine. 12 K. (1890 - Mi. #55A, Sc. #56) - Pale Lilac Carmine. 15 K. (1890 - Mi. #56A, Sc. #57) - Brownish Purple. 20 K. (1890 - Mi. #57A, Sc. #58) - Olive Green. 24 K. (1890 - Mi. #58A, Sc. #59) - Grayish Turquoise. 30 K. (1890 - Mi. #59A, Sc. #60) - Dark Orange Brown. 50 K. (1890 - Mi. #60A, Sc. #61) - Brown Violet. 01 G. (1890 - Mi. #61A, Sc. #62) - Blackish Ultramarine. 02 G. (1890 - Mi. #62A, Sc. #64) - Dark Carmine. The Michel / Scott catalog attributes, for stamps that are perforated 9 1/2, are as follows. 01 K. (1890 - Mi. #50B, Sc. #51) - Dark Gray. 02 K. (1890 - Mi. #51B, Sc. #52) - Dark Brownish Ocher. 03 K. (1890 - Mi. #52B, Sc. #53) - Dark Greenish Blue. 05 K. (1890 - Mi. #53B, Sc. #54) - Carmine. 10 K. (1890 - Mi. #54B, Sc. #55) - Grayish Ultramarine. 12 K. (1890 - Mi. #55B, Sc. #56) - Pale Lilac Carmine. 15 K. (1890 - Mi. #56B, Sc. #57) - Brownish Purple. 20 K. (1890 - Mi. #57B, Sc. #58) - Olive Green. 24 K. (1890 - Mi. #58B, Sc. #59) - Grayish Turquoise. 30 K. (1890 - Mi. #59B, Sc. #60) - Dark Orange Brown. 50 K. (1890 - Mi. #60B, Sc. #61) - Brown Violet. 01 G. (1890 - Mi. #61B, Sc. #62) - Blackish Ultramarine. 02 G. (1890 - Mi. #62B, Sc. #64) - Dark Carmine. The Michel / Scott catalog attributes, for stamps that are perforated 13 x 12 1/2, are as follows. 01 K. (1890 - Mi. #50C, Sc. #51) - Dark Gray. 02 K. (1890 - Mi. #51C, Sc. #52) - Dark Brownish Ocher. 03 K. (1890 - Mi. #52C, Sc. #53) - Dark Greenish Blue. 05 K. (1890 - Mi. #53C, Sc. #54) - Carmine. 10 K. (1890 - Mi. #54C, Sc. #55) - Grayish Ultramarine. 12 K. (1890 - Mi. #55C, Sc. #56) - Pale Lilac Carmine. 15 K. (1890 - Mi. #56C, Sc. #57) - Brownish Purple. 20 K. (1890 - Mi. #57C, Sc. #58) - Olive Green. 24 K. (1890 - Mi. #58C, Sc. #59) - Grayish Turquoise. 30 K. (1890 - Mi. #59C, Sc. #60) - Dark Orange Brown. 50 K. (1890 - Mi. #60C, Sc. #61) - Brown Violet. 01 G. (1890 - Mi. #61C, Sc. #62) - Blackish Ultramarine. 02 G. (1890 - Mi. #62C, Sc. #64) - Dark Carmine. The Michel / Scott catalog attributes, for stamps that are perforated 13 x 13 1/2, are as follows. 01 K. (1890 - Mi. #50D, Sc. #51) - Dark Gray. 02 K. (1890 - Mi. #51D, Sc. #52) - Dark Brownish Ocher. 03 K. (1890 - Mi. #52D, Sc. #53) - Dark Greenish Blue. 05 K. (1890 - Mi. #53D, Sc. #54) - Carmine. 10 K. (1890 - Mi. #54D, Sc. #55) - Grayish Ultramarine. 12 K. (1890 - Mi. #55D, Sc. #56) - Pale Lilac Carmine. 15 K. (1890 - Mi. #56D, Sc. #57) - Brownish Purple. 20 K. (1890 - Mi. #57D, Sc. #58) - Olive Green. 24 K. (1890 - Mi. #58D, Sc. #59) - Grayish Turquoise. 30 K. (1890 - Mi. #59D, Sc. #60) - Dark Orange Brown. 50 K. (1890 - Mi. #60D, Sc. #61) - Brown Violet. 01 G. (1890 - Mi. #61D, Sc. #62) - Blackish Ultramarine. 02 G. (1890 - Mi. #62D, Sc. #64) - Dark Carmine. The Michel / Scott catalog attributes, for stamps that are perforated 9 3/4, are as follows. 01 K. (1890 - Mi. #50E, Sc. #51) - Dark Gray. 02 K. (1890 - Mi. #51E, Sc. #52) - Dark Brownish Ocher. 03 K. (1890 - Mi. #52E, Sc. #53) - Dark Greenish Blue. 05 K. (1890 - Mi. #53E, Sc. #54) - Carmine. 10 K. (1890 - Mi. #54E, Sc. #55) - Grayish Ultramarine. 12 K. (1890 - Mi. #55E, Sc. #56) - Pale Lilac Carmine. 15 K. (1890 - Mi. #56E, Sc. #57) - Brownish Purple. 20 K. (1890 - Mi. #57E, Sc. #58) - Olive Green. 24 K. (1890 - Mi. #58E, Sc. #59) - Grayish Turquoise. 30 K. (1890 - Mi. #59E, Sc. #60) - Dark Orange Brown. The Michel / Scott catalog attributes, for stamps that are perforated 10 1/2, are as follows. 01 K. (1890 - Mi. #50F, Sc. #51) - Dark Gray. 02 K. (1890 - Mi. #51F, Sc. #52) - Dark Brownish Ocher. 03 K. (1890 - Mi. #52F, Sc. #53) - Dark Greenish Blue. 05 K. (1890 - Mi. #53F, Sc. #54) - Carmine. 10 K. (1890 - Mi. #54F, Sc. #55) - Grayish Ultramarine. 12 K. (1890 - Mi. #55F, Sc. #56) - Pale Lilac Carmine. 15 K. (1890 - Mi. #56F, Sc. #57) - Brownish Purple. 20 K. (1890 - Mi. #57F, Sc. #58) - Olive Green. 24 K. (1890 - Mi. #58F, Sc. #59) - Grayish Turquoise. 30 K. (1890 - Mi. #59F, Sc. #60) - Dark Orange Brown. 50 K. (1890 - Mi. #60F, Sc. #61) - Brown Violet. 01 G. (1890 - Mi. #61F, Sc. #62) - Blackish Ultramarine. 02 G. (1890 - Mi. #62F, Sc. #64) - Dark Carmine. The Michel / Scott catalog attributes, for stamps that are perforated 11, are as follows. 01 K. (1890 - Mi. #50G, Sc. #51) - Dark Gray. 02 K. (1890 - Mi. #51G, Sc. #52) - Dark Brownish Ocher. 03 K. (1890 - Mi. #52G, Sc. #53) - Dark Greenish Blue. 05 K. (1890 - Mi. #53G, Sc. #54) - Carmine. 10 K. (1890 - Mi. #54G, Sc. #55) - Grayish Ultramarine. 12 K. (1890 - Mi. #55G, Sc. #56) - Pale Lilac Carmine. 15 K. (1890 - Mi. #56G, Sc. #57) - Brownish Purple. 20 K. (1890 - Mi. #57G, Sc. #58) - Olive Green. 30 K. (1890 - Mi. #59G, Sc. #60) - Dark Orange Brown. 01 G. (1890 - Mi. #61G, Sc. #62) - Blackish Ultramarine. The Michel / Scott catalog attributes, for stamps that are perforated 11 1/2, are as follows. 01 K. (1890 - Mi. #50H, Sc. #51) - Dark Gray. 02 K. (1890 - Mi. #51H, Sc. #52) - Dark Brownish Ocher. 03 K. (1890 - Mi. #52H, Sc. #53) - Dark Greenish Blue. 05 K. (1890 - Mi. #53H, Sc. #54) - Carmine. 10 K. (1890 - Mi. #54H, Sc. #55) - Grayish Ultramarine. 12 K. (1890 - Mi. #55H, Sc. #56) - Pale Lilac Carmine. 15 K. (1890 - Mi. #56H, Sc. #57) - Brownish Purple. 20 K. (1890 - Mi. #57H, Sc. #58) - Olive Green. 24 K. (1890 - Mi. #58H, Sc. #59) - Grayish Turquoise. 30 K. (1890 - Mi. #59H, Sc. #60) - Dark Orange Brown. 50 K. (1890 - Mi. #60H, Sc. #61) - Brown Violet. 01 G. (1890 - Mi. #61H, Sc. #62) - Blackish Ultramarine. 02 G. (1890 - Mi. #62H, Sc. #64) - Dark Carmine. The Michel / Scott catalog attributes, for stamps that are perforated 12, are as follows. 01 K. (1890 - Mi. #50J, Sc. #51) - Dark Gray. 02 K. (1890 - Mi. #51J, Sc. #52) - Dark Brownish Ocher. 03 K. (1890 - Mi. #52J, Sc. #53) - Dark Greenish Blue. 05 K. (1890 - Mi. #53J, Sc. #54) - Carmine. 10 K. (1890 - Mi. #54J, Sc. #55) - Grayish Ultramarine. 30 K. (1890 - Mi. #59J, Sc. #60) - Dark Orange Brown. 01 G. (1890 - Mi. #61J, Sc. #62) - Blackish Ultramarine. The Michel / Scott catalog attributes, for stamps that are perforated 12 1/2, are as follows. 01 K. (1890 - Mi. #50K, Sc. #51) - Dark Gray. 02 K. (1890 - Mi. #51K, Sc. #52) - Dark Brownish Ocher. 03 K. (1890 - Mi. #52K, Sc. #53) - Dark Greenish Blue. 05 K. (1890 - Mi. #53K, Sc. #54) - Carmine. 10 K. (1890 - Mi. #54K, Sc. #55) - Grayish Ultramarine. 12 K. (1890 - Mi. #55K, Sc. #56) - Pale Lilac Carmine. 15 K. (1890 - Mi. #56K, Sc. #57) - Brownish Purple. 20 K. (1890 - Mi. #57K, Sc. #58) - Olive Green. 24 K. (1890 - Mi. #58K, Sc. #59) - Grayish Turquoise. 30 K. (1890 - Mi. #59K, Sc. #60) - Dark Orange Brown. 50 K. (1890 - Mi. #60K, Sc. #61) - Brown Violet. 01 G. (1890 - Mi. #61K, Sc. #62) - Blackish Ultramarine. 02 G. (1890 - Mi. #62K, Sc. #64) - Dark Carmine. The Michel / Scott catalog attributes, for stamps that are perforated 13, are as follows. 01 K. (1890 - Mi. #50L, Sc. #51) - Dark Gray. 02 K. (1890 - Mi. #51L, Sc. #52) - Dark Brownish Ocher. 03 K. (1890 - Mi. #52L, Sc. #53) - Dark Greenish Blue. 05 K. (1890 - Mi. #53L, Sc. #54) - Carmine. 15 K. (1890 - Mi. #56L, Sc. #57) - Brownish Purple. 30 K. (1890 - Mi. #59L, Sc. #60) - Dark Orange Brown. 01 G. (1890 - Mi. #61L, Sc. #62) - Blackish Ultramarine. 02 G. (1890 - Mi. #62L, Sc. #64) - Dark Carmine. The Michel / Scott catalog attributes, for stamps that are perforated 13 1/2, are as follows. 01 K. (1890 - Mi. #50M, Sc. #51) - Dark Gray. 02 K. (1890 - Mi. #51M, Sc. #52) - Dark Brownish Ocher. 03 K. (1890 - Mi. #52M, Sc. #53) - Dark Greenish Blue. 05 K. (1890 - Mi. #53M, Sc. #54) - Carmine. 10 K. (1890 - Mi. #54M, Sc. #55) - Grayish Ultramarine. 12 K. (1890 - Mi. #55M, Sc. #56) - Pale Lilac Carmine. 15 K. (1890 - Mi. #56M, Sc. #57) - Brownish Purple. Many of these new Austrian Empire issues exist with red, blue, violet, Offices in the Turkish Empire, first-day-of-issue, and last day of use postmarks, and many of them are not terribly expensive. The four major-type Austrian Empire portrait definitive stamps shown above were issued on March 16, 1891. They are printed on unwatermarked granite paper, and they were also produced in many perforation gauges. The numerals on these denominations are printed in black on a colorless background. The Michel / Scott catalog attributes, for Austrian Empire stamps that are perforated 10, are as follows. The colors used in the table are from the Michel catalog. 20 K. (1891 - Mi. #63A, Sc. #66) - Greenish Olive. 24 K. (1891 - Mi. #64A, Sc. #67) - Grayish Blue. 30 K. (1891 - Mi. #65A, Sc. #68) - Sienna. 50 K. (1891 - Mi. #66A, Sc. #69) - Brownish Violet. The Michel / Scott catalog attributes, for Austrian Empire stamps that are perforated 9 1/4, are as follows. 30 K. (1891 - Mi. #65B, Sc. #68b) - Sienna. The Michel / Scott catalog attributes, for Austrian Empire stamps that are perforated 11, are as follows. 20 K. (1891 - Mi. #63C, Sc. #66) - Greenish Olive. 24 K. (1891 - Mi. #64C, Sc. #67) - Grayish Blue. 30 K. (1891 - Mi. #65C, Sc. #68) - Sienna. 50 K. (1891 - Mi. #66C, Sc. #69) - Brownish Violet. The Michel / Scott catalog attributes, for Austrian Empire stamps that are perforated 13 1/2, are as follows. 20 K. (1891 - Mi. #63D, Sc. #66) - Greenish Olive. 24 K. (1891 - Mi. #64D, Sc. #67) - Grayish Blue. 30 K. (1891 - Mi. #65D, Sc. #68) - Sienna. The Michel / Scott catalog attributes, for Austrian Empire stamps that are perforated 10 1/2, are as follows. 20 K. (1891 - Mi. #63E, Sc. #66) - Greenish Olive. 24 K. (1891 - Mi. #64E, Sc. #67) - Grayish Blue. 30 K. (1891 - Mi. #65E, Sc. #68) - Sienna. 50 K. (1891 - Mi. #66E, Sc. #69) - Brownish Violet. The Michel / Scott catalog attributes, for Austrian Empire stamps that are perforated 11 1/2, are as follows. 20 K. (1891 - Mi. #63F, Sc. #66) - Greenish Olive. 24 K. (1891 - Mi. #64F, Sc. #67) - Grayish Blue. 30 K. (1891 - Mi. #65F, Sc. #68) - Sienna. 50 K. (1891 - Mi. #66F, Sc. #69) - Brownish Violet. The Michel / Scott catalog attributes, for Austrian Empire stamps that are perforated 12 1/2, are as follows. 20 K. (1891 - Mi. #63G, Sc. #66) - Greenish Olive. 24 K. (1891 - Mi. #64G, Sc. #67) - Grayish Blue. 30 K. (1891 - Mi. #65G, Sc. #68) - Sienna. 50 K. (1891 - Mi. #66G, Sc. #69) - Brownish Violet. 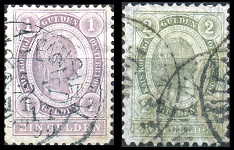 The two Gulden denomination Austrian Empire stamps shown above were re-issued in new colors on February 1, 1896. These two Austrian Empire re-issues were in use for a very short period of time, due to the currency reform of 1899. As a result, used condition stamps are much scarcer and higher priced than unused condition stamps. The Michel / Scott catalog attributes, for Austrian Empire stamps that are perforated 10 1/2, are as follows. The colors used in the table are from the Michel catalog. 01 G. (1896 - Mi. #67A, Sc. #63) - Dark Violet Gray. 02 G. (1896 - Mi. #68A, Sc. #65) - Gray Green. 01 G. (1896 - Mi. #67B, Sc. #63) - Dark Violet Gray. 02 G. (1896 - Mi. #68B, Sc. #65) - Gray Green. 01 G. (1896 - Mi. #67C, Sc. #63) - Dark Violet Gray. 02 G. (1896 - Mi. #68C, Sc. #65) - Gray Green. 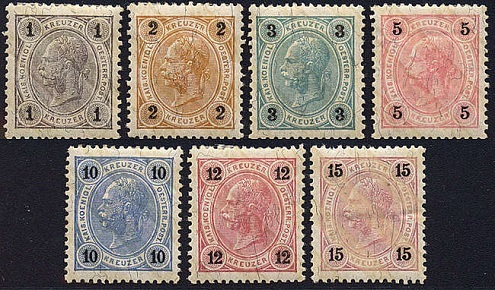 The eleven perforated proof Kreuzer denomination Austrian Empire stamps shown above (Mi. #50PIII-56PIII, #63PII-66PII) were used for experimentation with a new concept of applying varnish bars to the paper, before the stamps were printed. These experimental proofs are a bit pricey, but they are still quite affordable, for the dedicated Austrian philatelist. This was a security measure, designed to prevent the erasure of a postmark and the re-use of the postage stamp. If one tried to erase the postmark on these types of stamps, the printed stamp design would also be erased, rendering it useless as a postage stamp. Varnish bars were applied to the paper used for the printing of all Austrian stamps beginning in 1901, after the change-over from the Gulden currency (100 Kreuzer = 1 Gulden) to the new Kronen currency (100 Heller = 1 Krone).